Joy Scott and Kat Selvocki stage a costumed chance meeting at Seattle Center for item #61 of GISHWHES, the Greatest International Scavenger Hunt the World Has Ever Seen, in August. Their team, the Vatican Cameos, ranked in the top 10 last year. (Courtesy Vatican Cameos). Photo gallery. Jesse Mazur, a colleague of GISHWHES team member H.B. Siegel, folds laundry in his Storm Trooper costume for item #5. (Courtesy Vatican Cameos) Photo gallery. “OOF” is “out of office.” GISHWHES, pronounced “gish-wes,” is the Greatest International Scavenger Hunt the World Has Ever Seen. Yes, it’s a real thing and, yes, Vaughn, an attorney specializing in intellectual-property law, took most of a week off work to do it. There was the seated Japanese tea ceremony in the elevator of the apartment building on 12th and Jefferson. 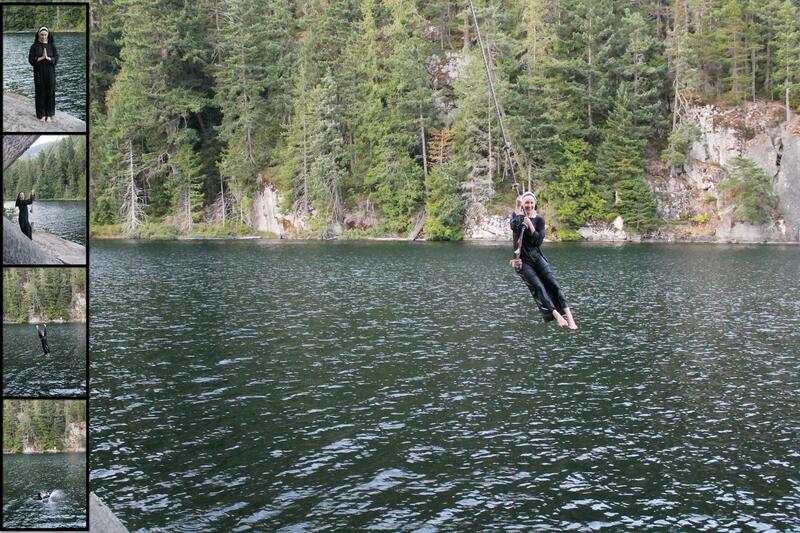 The nun who swung from a rope into a river outside Vancouver, B.C. There was the robot barista who served customers at a San Diego Starbucks, the storm trooper who folded clothes at Ballard’s Lunar Laundry, the woman who collected signatures to “pave all of California’s beaches so we don’t have to get all sandy to go swimming” and that time the guard waved Vaughn into the University of Washington’s Center for Experimental Nuclear Physics and Astrophysics, because she wasn’t the first person that day to show up in a Flash costume and ask to pose with the particle accelerator. Charles Morrison will write four today. He wrote four yesterday. And the day before that. And the day before that. All told he’s penned 4,000 letters to about 110 people in the past 11 years, hardly ever missing a day. They’re nothing grand. Just “letters by a guy of modest intelligence who likes to write,” as the 71-year-old put it. He mailed 150 of them at his Shoreline post office two weeks ago. Each was written with one of 36 calligraphy pens, and each is about something completely different. I have no idea when I wrote my last letter. I told Morrison as much at Caffe Umbria in Pioneer Square last week. Most of the people walking by on Occidental Avenue South, I guessed out loud, probably wouldn’t know either. “It’s so easy to get information, give information, dash off an email. The very ease of it makes it so convenient,” he said. “Convenient,” he added, is not one of his favorite words. The five capital letters are 96 years old. They’re embossed on terra cotta panels mortared into brick on the north face of the historic Bemis building in Sodo, and they’re beautiful. Almost regal. Andrea Leksen just turned them into a font. The 249 letters, numbers and characters in the all-caps Bemis typeface took Leksen, a freelance designer and an adjunct professor at Seattle Pacific University, a year and a half to complete. Bemis is the first typeface she’s ever put up for sale; it was the No. 39 “hot font” on online marketplace myfonts.com Friday. It’s also what’s known as a font “revival,” script from a nondigital past made a part of our technological present. The Bemis font grew out of a classroom assignment: Draft a font from something old you see in Seattle, Leksen told her Applied Type students last year, then joined them in the hunt.